While shopping at Chicago's Magnificent Mile mall patrons can look to the ceiling and see a 190-foot long canopy of trees. Or, if they look at another moment, they may see a kaleidoscope of colours or a flock of local birds. That's because the skylight is actually a high definition LED canvas with content created at 16k resolution. 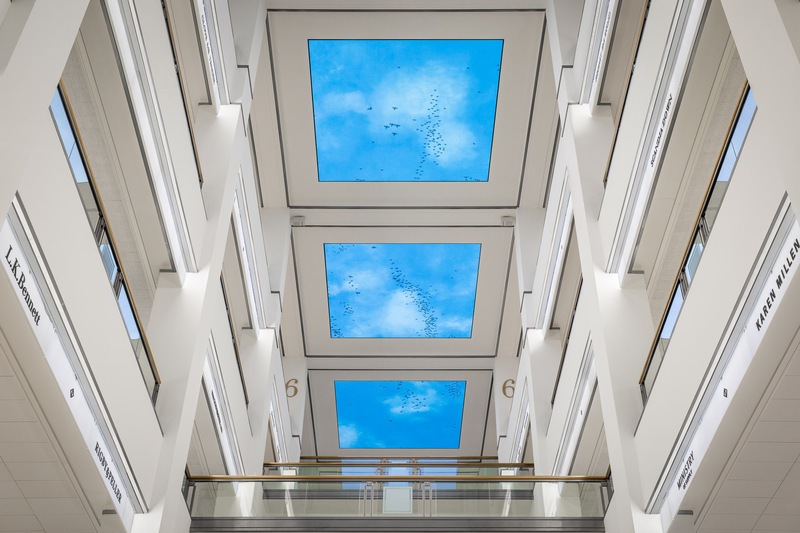 And while the centrepiece of the installation is the magnificent ceiling, visible from all seven floors of the atrium, the entire mall experience has been informed with digital signage. 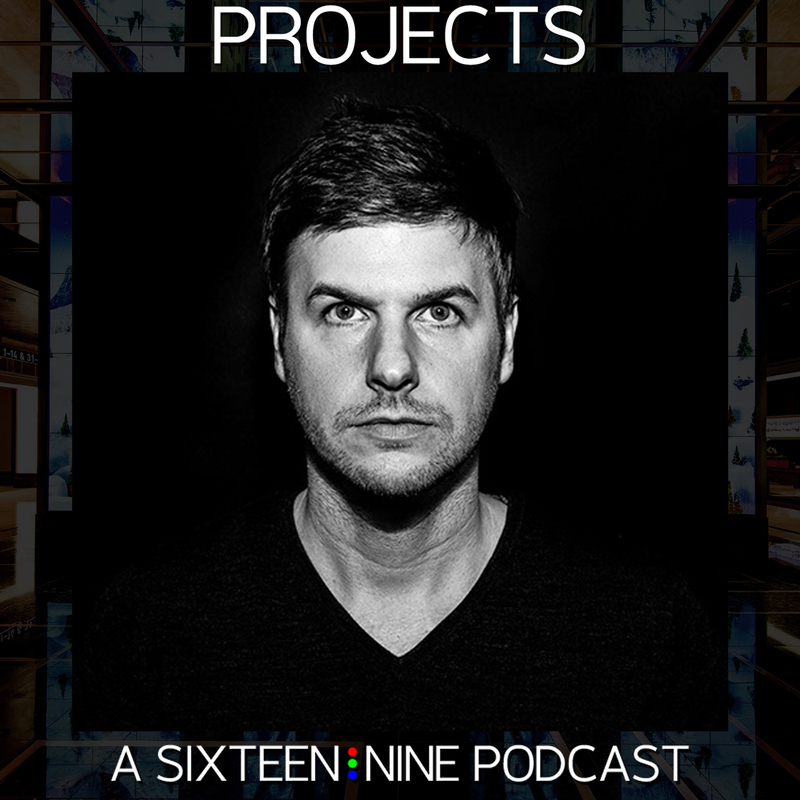 I spoke with ESI Design's Director of Media Architecture, Greg Gallimore, via Skype about how they updated this 30-year-old high-end shopping destination by creating a unique atmosphere with thinking that was detailed enough to include The Cedar Waxwing, a bird local to the Chicago area. The new Air Jordan store, opened in downtown Toronto in 2017, is a three-story retail environment created with the notion of providing a true customer experience. It features an underground kids-only concourse, an industrial-designed retail level, and an upper athletic training facility. 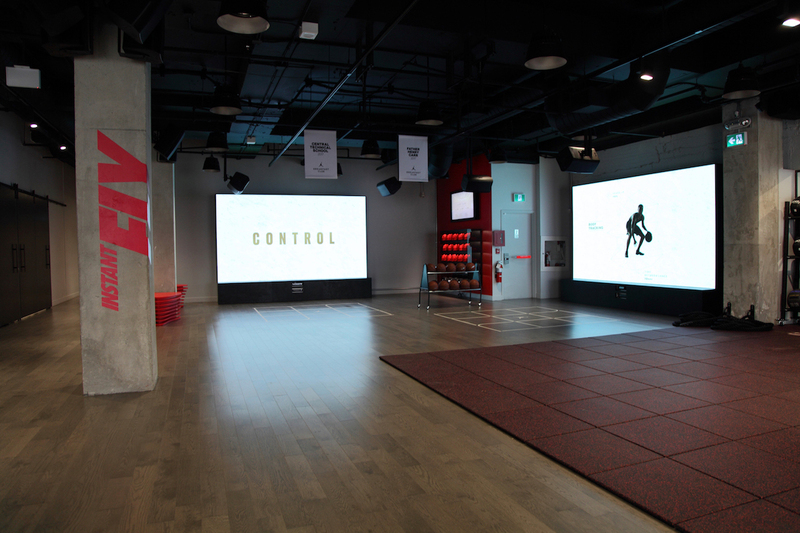 While digital signage is limited to just two areas on the top floor, the way in which Air Jordan conceived of the store as a holistic experience, shows how screens and their content are just a part of the overall environment. On top of the DJ booth, you'll also find two separate zones for what's called the "Jordan Standard Games", which are interactive display-based grid tests that compare your agility level to Michael Jordan’s. I spoke with Mark McPherson, Executive VP and Scott Wouters, Director Project Implementation, from Advanced, an AV solutions provider in Toronto, about how this project is an indication of where retail could be heading in the future. Imagine, while sitting in the lobby waiting for your next meeting, three walls around you change; placing you in a cocaine manufacturing camp in the jungles of Colombia. Minutes later they change again to drop you into a prison cafeteria in upper New York state. When Netflix was designing the lobby of their new Hollywood Head Office, they said they wanted "Wow Factor" and that's what they got with the 1.9mm 13K LED - 12’h x 80’w screen that dominates their lobby. The content is custom designed to promote Netflix programming, including Narcos and Orange Is The New Black. 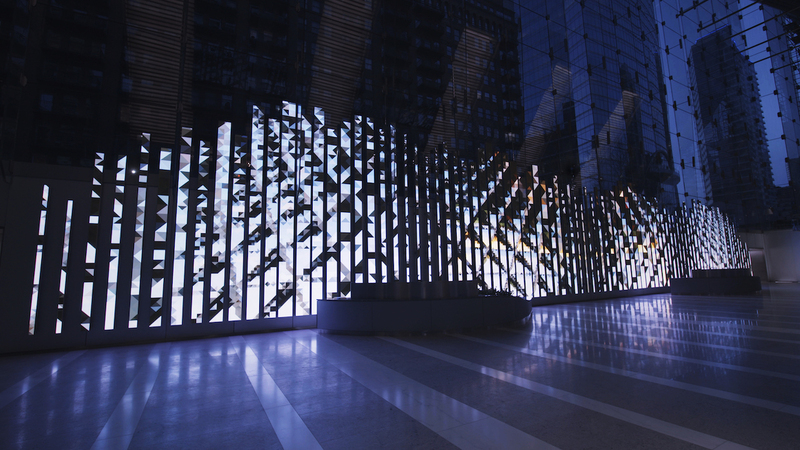 I spoke with Meric Adriansen, EVP of Systems & Technology for D3 LED, about this impressive installation. 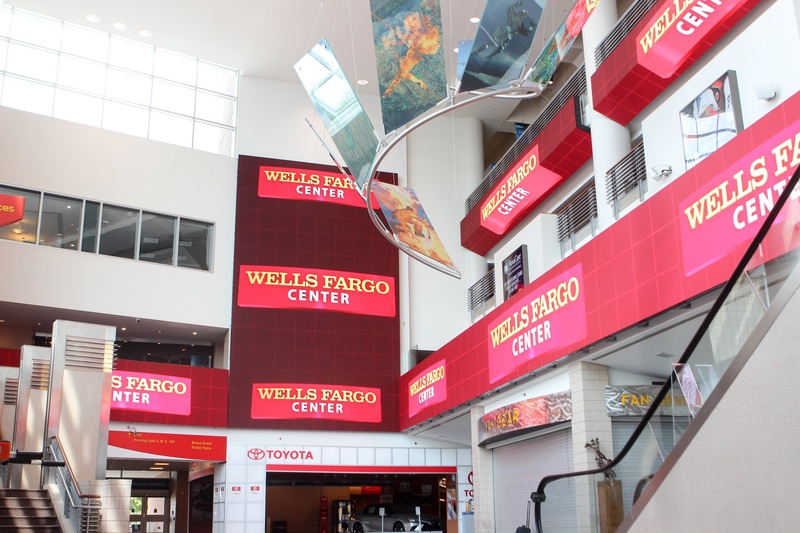 Wells Fargo Center in Philadelphia is home to both the 76ers basketball team and Flyers hockey team, as well as the usual stream of arena-scale concerts and events (I'm looking at you Disney On Ice). This episode we talk to Chris Mascatello, Executive Vice President - Technology Solutions for ANC. Personalized RFID check-in, transparent OLED, a 30-foot projection screen and virtual reality. That's just some of what the Minnesota Vikings put in place as they moved into their new U.S. Bank Stadium in 2016. The Vikings worked with Dimensional Innovations to create this space for fans, which allows users to catch a pass while wearing a virtual reality Vikings helmet or run the three-cone drill against a current Vikings player’s pace, plus a number of other innovative interactive elements. I spoke with Curtis Walker, Technology Director of Dimensional Innovations, about everything that's in the experience and the thinking behind it. This video highlights the installation. This isn't a project that's large in terms of pixels or screen counts; its impact is in its scale. The Canadian city of Sudbury is about a four-hour drive north of Toronto. With a population a little less than Jackson Mississippi, it is the seventh largest municipality by area in Canada. Capital Networks has been working with the City since 2014 to help them coordinate their digital signage strategy to both employees and citizens across multiple City venues. That means over 45 locations including pools & recreation centres, Fire and Ambulance halls, arenas, public transit, and the Airport. Interestingly the 'ownership' of digital signage rests with the Technology department. This frees up business groups to focus on their message, not the technology. 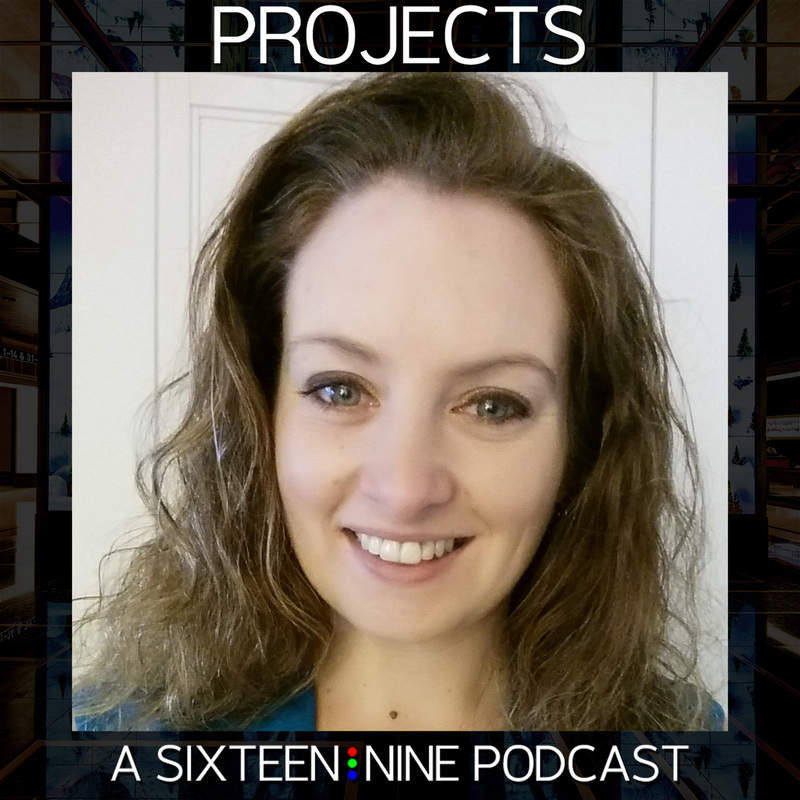 I spoke with Kelly Smith, Account Executive, with Capital Networks about whether IT ownership makes sense in all scenarios, and whether the lack of an overall message owner is an issue. Downtown Washington, D.C.'s Terrell Place is an office and retail complex named after civil rights activist Mary Church Terrell, a founding member of the NAACP, who led the protest against segregation at Hecht’s lunch counter in the 1950s. Building owners, Beacon Capital asked ESI Design to transform the disjointed lobby, which is comprised of three connected components, including the former Hecht’s department store. ESI’s designers unified the space by treating it as a single canvas. 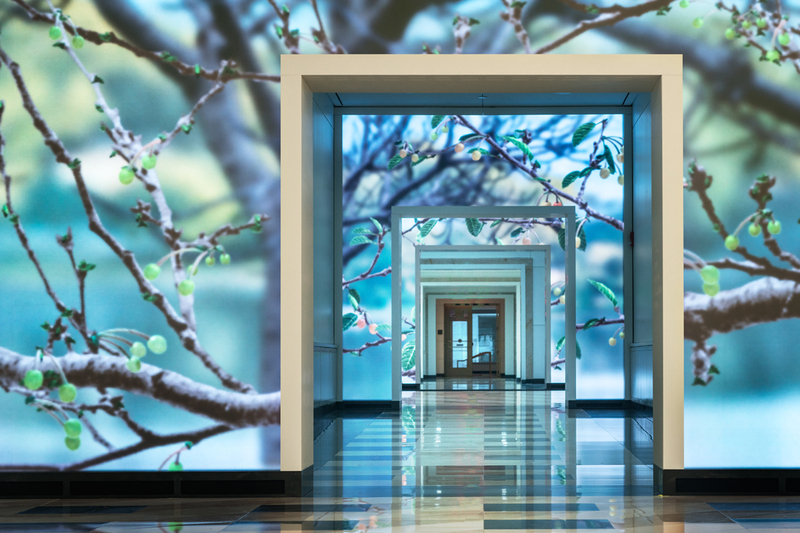 Installing large-scale diffused LED displays with reactive media on the lobby walls and corridor portals created a sense of connection across the building’s common areas. The content is activated by passersby via an infrared camera system. The resulting scenes ebb and flow with the pedestrian traffic inside the lobby. At 80 feet wide x 13 feet high, the largest media wall is visible from the street through the oversize windows that were once the display windows of the department store. 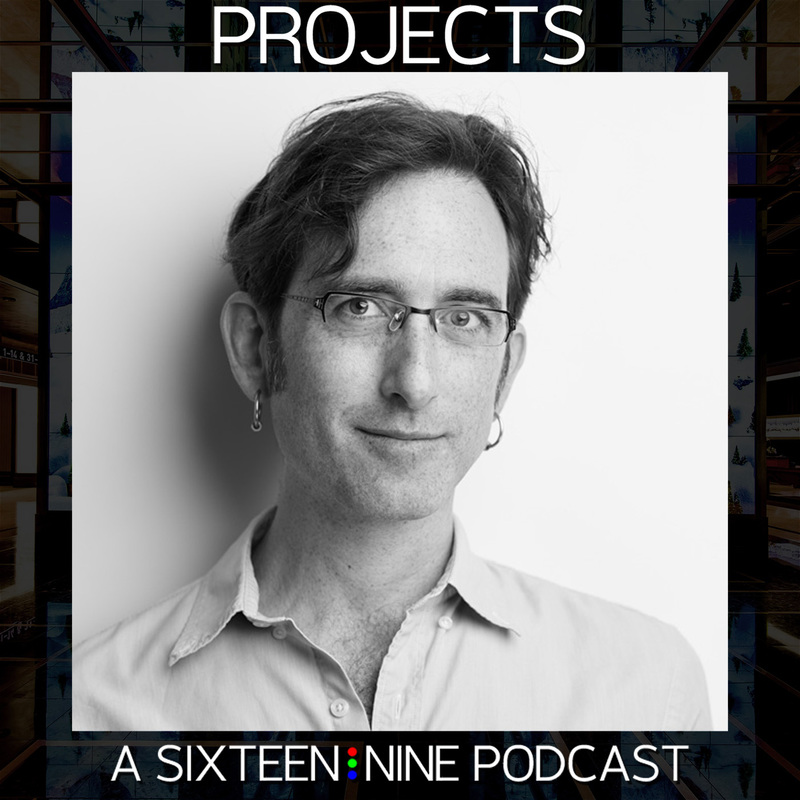 I spoke with Michael Luck Schneider, Senior Creative Technology Designer at ESI Design about this visually stunning installation and it's details, including ambient sound. 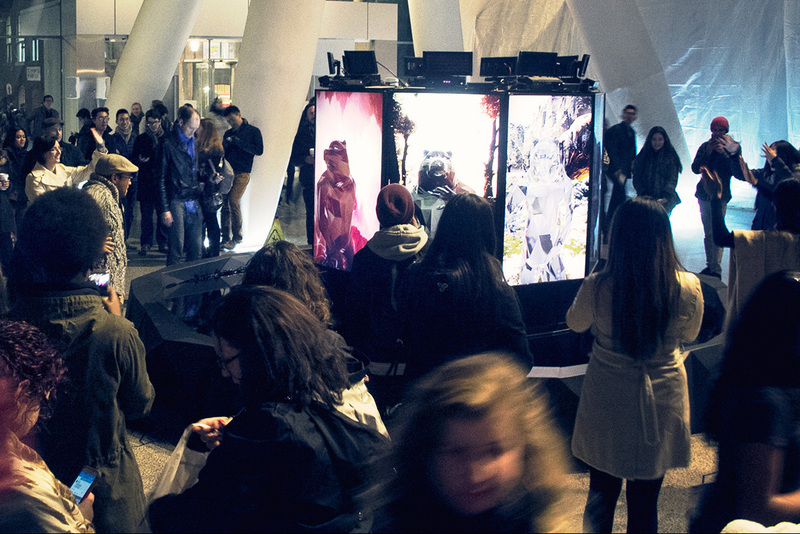 Every year Toronto hosts "Scotiabank Nuit Blanche" an overnight art event that takes place across the entire city. In 2015 SapientNitro (now SapientRazorfish) had just moved into their new offices and worked with their landlord, Allied Reit, to come up with something interesting for the lobby of the building. The idea they came up with was 'Mimir's Well', a very old story about the Norse God Oldin, who sacrificed his eye to drink from Mirmir's Well and gain the wisdom and memory of the nine worlds. Using Kinect technology, Unity 3D animation and parametric speakers guests stepping up to one of the nine sides of the exhibition were met with screens showing their own reflections, which soon morphed them into an animal of Norse lore. As visitors experimented with their newly adopted forms, sound enveloped them while their surroundings transformed into one of the nine Norse worlds. I spoke with Graham Ameron, who is Associate Creative Director at SapientRazorfish, about the technology and thinking behind this 12 hour installation. 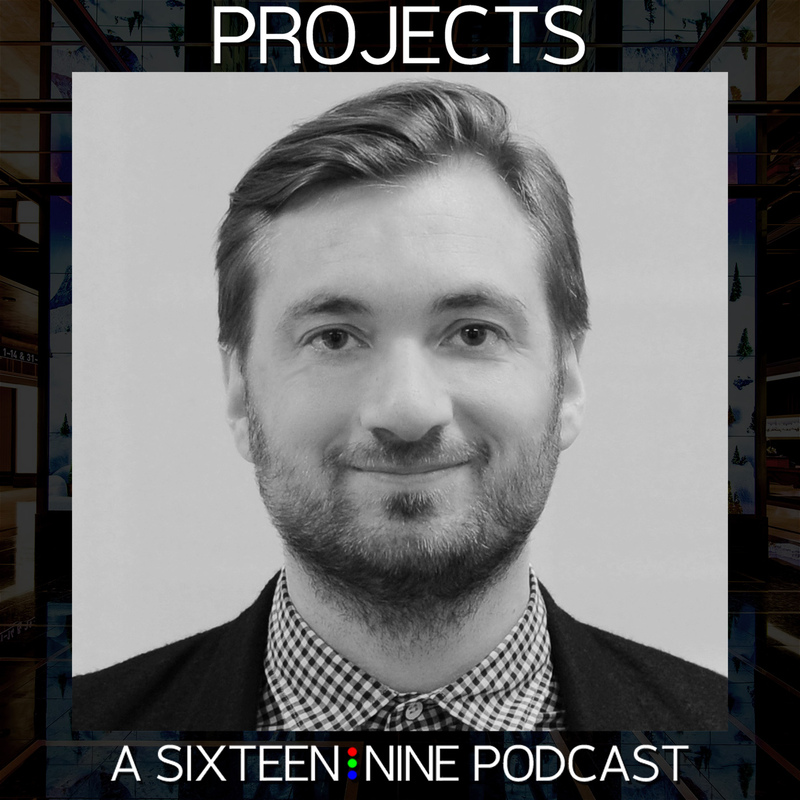 This episode we're speaking with Dave Etherington, who is CSO of Intersection, one of the companies responsible for LinkNYC. 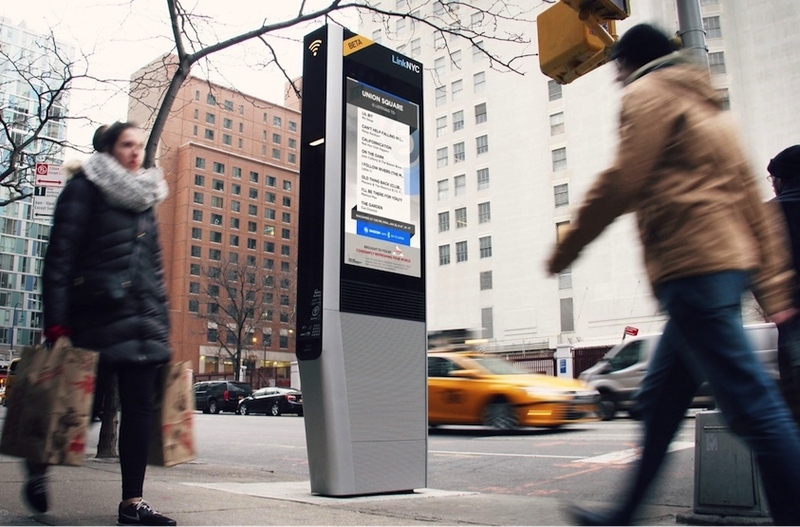 In 2014 New York City set out to overhaul their payphone infrastructure. The result is LinkNYC which provides anyone in New York City with free phone calls to anywhere in the U.S., free wifi, local information and some other things that Dave and I discuss. It's all supported by advertising, but as you'll hear, that can be OK. This is a really big project, with over $200 million invested in new fiber optic cable to support the more than 7,500 Link kiosks that will be installed over the next eight years. In fact, Dave tells me that this is "the largest deployment of digital displays in the world". We talked about this Apex Award winning installation via Skype.